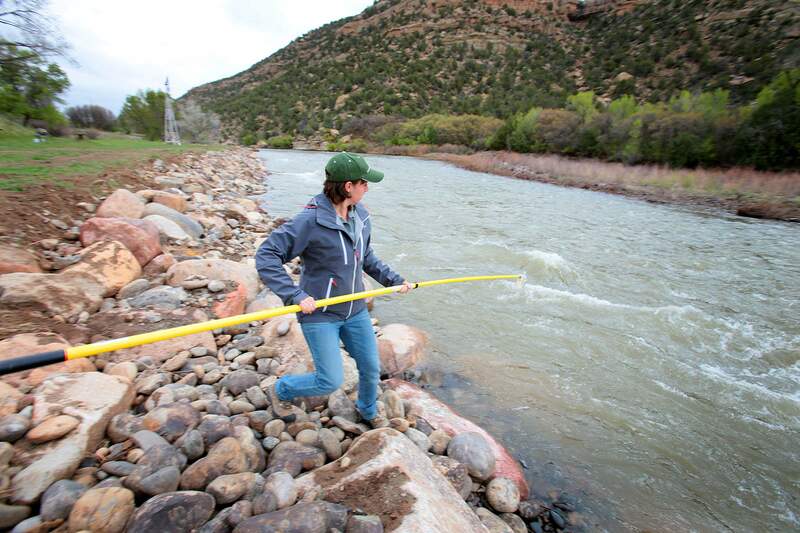 Natural Resource Specialist with the San Juan Soil & Water Conservation District, Melissa May, prepares to take samples of water from the Animas River just upstream from the New Mexico State line in May. Elevated levels of bacteria from human waste were found at this test site. Elevated levels of bacteria from human waste have been found in the Animas River at the Colorado and New Mexico border for the first time. Although E. coli pollution has been a problem in the Animas and San Juan rivers in New Mexico for years, this study also revealed a different kind of bacteria found in human feces. “It’s not a result we had hoped to see. ... We had hoped to be able to say the water coming out of Colorado is nice and clean,” said Ann Oliver, the coordinator for the Animas Watershed Partnership. The San Juan Watershed Group found the bacteria as part of a two-year study of the Animas and the San Juan rivers. Researchers focused on water quality in New Mexico, except for one point at the Colorado and New Mexico border. The point on the border was studied for only one year, making the sample size smaller. But it is a red flag, especially because the levels of human bacteria dropped at sites tested downstream. “The public should have some concern about the recreational use of these rivers,” said Geoffrey Smith, biologist at New Mexico State University, who worked on the study. However, the bacteria is not found in treated drinking water. The study found bacteria from animals such as cattle and elk in 90 percent of the samples and bacteria from humans in 80 percent of the samples across both rivers, Smith said. Bacteria from human waste could be coming from leaking septic tanks, people who illegally dump waste, going to the bathroom outside or from waste-water treatment plants, Oliver said. This finding is concerning because bacteria from human waste is more likely to make people sick with viral and bacterial infections than animal bacteria, Smith said. “The risk is low that pathogens that can effect humans are in the water ... but that doesn’t mean that there is no risk,” Oliver said. The researchers found the highest levels of bacteria in late fall and the lowest in the spring, Smith said. Making it likely, the fall rains are washing bacteria into the rivers, he said. Finding where the bacteria is coming from, such as faulty septic systems, is the next step in eliminating the pollution. More data analysis may help identify some sources, said Neal Schaeffer of the New Mexico Environment Department’s Surface Water Quality Bureau. Right now, the watershed group does not have funding to do additional sampling, Smith said. In a related study by the Animas Watershed Partnership, levels of E. coli exceeding the state standard were found in the Florida River near Bondad Hill, Oliver said. Once the Florida joins the Animas, the E. coli is diluted, and it no longer exceeds state standards, she said. It is not known whether the E. coli is from human or animal sources. The partnership received an $8,000 grant in February from the Southwestern Water Conservation District to do further sampling. The group also is working with landowners to improve irrigation practices to prevent manure and other fertilizers from washing into the river, Oliver said. Both groups plan to do outreach meetings with the public to talk about their findings and possible sources of bacteria. But dates have not been selected yet. “Instead of saying who’s to blame, it’s more who can help solve this problem,” said Melissa May, an organizer with the San Juan Watershed Group and a natural resource specialist with the San Juan Soil & Water Conservation District.